Fresh, bold and wild, Belmond Andean Explorer arrives on the horizon in striking style as the first luxury sleeper train in South America. The silky midnight-blue livery of the train’s 16 carriages shimmers against the backdrop of Peru’s lofty landscapes as it soars across the Andean plains. Breathe in crisp evening air from the train’s open deck with the majestic La Raya mountain range rising into view. The menu is as colourful as the scenery, with seasonal dishes prepared using fresh local ingredients. Connect with fellow guests in the lounge car and sip a pisco sour to the tune of sweet piano melodies. Retreat to the spa car for a reviving Andean ritual and soothing massage. Then retire to your en-suite cabin for a restful night's sleep—tomorrow brings new adventures. Unveil the spirit of Peru with an awe-inspiring escape on Belmond Andean Explorer. An unprecedented rail experience calls for a fresh approach to luxury design. 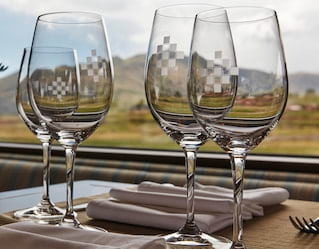 Belmond Andean Explorer marks a departure from classic vintage luxury, instead evoking a contemporary aesthetic perfectly designed to frame the awe-inspiring Andean landscape. Sink into the serenity of light earthen tones pierced by vibrantly coloured accents, complete with textured leather and alpaca wool. Each carriage carries the names of flora and fauna found along the route. The dining car Muna is named for a soothing Andean herb, and the spa car Picaflor, after the gentle hummingbird. Embracing the ancient Chakana cross as its symbol, this Inca motif is a charm for the marriage of the earth, the underworld and the starry heavens. You’ll find it in all the little details of the train’s design. Take in the rugged beauty of rural Peru and the tranquility of Lake Titicaca. Discover a floating community at the unique Islas Uros, a fascinating collection of man-made islands using buoyant reeds to stay afloat. Pause en-route from Puno to Cusco at the La Raya market, a colourful stretch of stalls brimming with handicrafts and traditional ware. 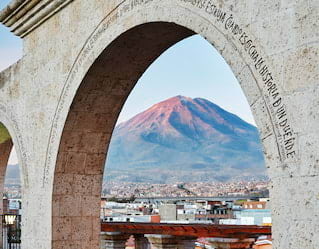 Arrive in style to Arequipa; Peru’s second city is rich in vibrant colours and enticing spice-laden scents. Journeys from Cusco to Arequipa capture the heart of the Andean region, with a range of inspiring excursions each day.